Background: Caffeine which exists in drinks such as coffee as well as in drug dosage forms in the global market is among the materials that increase alertness and decrease fatigue. Compared to other forms of caffeine, caffeine gum can create faster and more prominent effects. In this study, the main goal is to design a new formulation of caffeine gum with desirable taste and assess its physicochemical properties. Materials and Methods: Caffeine gum was prepared by softening of gum bases and then mixing with other formulation ingredients. To decrease the bitterness of caffeine, sugar, aspartame, liquid glucose, sorbitol, manitol, xylitol, and various flavors were used. Caffeine release from gum base was investigated by mechanical chewing set. Content uniformity test was also performed on the gums. The gums were evaluated in terms of organoleptic properties by the Latin-Square design at different stages. Results: After making 22 formulations of caffeine gums, F 11 from 20 mg caffeine gums and F 22 from 50 mg caffeine gums were chosen as the best formulation in organoleptic properties. Both types of gum released about 90% of their own drug content after 30 min. Drug content of 20 and 50 mg caffeine gum was about 18.2-21.3 mg and 45.7-53.6 mg respectively. Conclusion: In this study, 20 and 50 mg caffeine gums with suitable and desirable properties (i.e., good taste and satisfactory release) were formulated. The best flavor for caffeine gum was cinnamon. Both kinds of 20 and 50 mg gums succeeded in content uniformity test. The main purpose of this study is to design, formulate and evaluate caffeine gums with suitable taste and quality in order to improve the mood and increase alertness, focus and cognitive performance in people. The substances that were used in this study include four gum bases Elvazti, 487, Fruit C and Stick from Gilan Ghoot Company, (Rasht, Iran) and caffeine, aspartame, glycerin, xylitol, manitol and sorbitol from Sigma-Aldrich Chemie Gmbh‚ (Steinheim, Germany). Flavors of peppermint, cinnamon, cola, eucalyptus and banana were gifted by Goltash Company (Isfahan, Iran) and flavor of cherry from Farabi Pharmaceutical Company (Isfahan, Iran). First, the mixture of gum bases were weighed and carefully put inside a mortar on the water bath at 60°C temperature until it became soft. After softening the gum bases, other ingredients were added at a suitable time with a constant temperature. At first, the active substance powder (caffeine) with aspartame and xylitol were triturated and then levigated with liquid glucose and glycerin, and were added to the gum bases mixture and mixed thoroughly. Then, a desired amount of sugar was added and mixed thoroughly until a uniformed mixture was achived. At the end of preparation, the temperature of the mixture was set below 40°C and the flavor was added gradually and mixed. When mixing was completed, the gum was placed on a glass plate, and then formatted into small bars with proper thickness and dimension. These gums were placed at the room temperature and packaged. The first sugar-coating layer contained acacia and sugar. Second and third sugar-coating layers consisted of acacia, sugar, and calcium carbonate. Various concentrations of caffeine prepared; first, the phosphate buffer was added to 10 mg of caffeine in a 100 ml calibration flask to obtain 100 ml solution. Then respectively 0.5, 1, 1.5, 2, 2.5, and 3 ml were taken from this solution and transferred to a 10 ml calibration flask and buffered to 10 ml volume. Thus, 5, 10, 15, 20, 25, and 30 μg/ml concentrations were prepared. In order to determine intraday and interdays variabilities, 3 samples from each concentration were prepared and this test was repeated for 3 consecutive days. After computing the average of absorbencies, a direct linear equation was obtained, and the related curve was plotted. When the chewing machine started to work under above-mentioned conditions, samples were taken from the chamber at 5, 10, 15, 20, 30, 40 and 50 min. In each sampling, for 20 and 50 mg gums, 1 and 0.5 ml of sample were taken from the chamber, and 1 and 0.5 ml of fresh phosphate buffer at 37°C temperature were added to the chamber, respectively. Furthermore, one placebo gum (gum without drug) was placed in the chewing machine, and samples were taken in above-mentioned times. The samples were buffered up to 10 ml volume with phosphate buffer and their absorbencies were measured by a spectrophotometer set at wavelength 273.2 nm. This procedure was repeated three times. Absorbencies of placebo gum samples were subtracted from the absorbencies of caffeine gums samples. Finally, concentrations and the amount of caffeine that released at each stage were determined by the linear equation of the standard curve. The spectrophotometric analysis in chloroform was done by a method similar to the analysis performed in the phosphate buffer. Here, the wavelength at which the most absorbance occurs (λmax ) was determined with the 10 μg/ml solution too, and it was 276.8 nm. Ten gums were randomly selected from the prepared 20 and 50 mg gums, and were weighed and the amount of their caffeine were measured. In order to determine the amount of caffeine in the gums, each gum was dissolved in 100 ml chloroform. When dissolving was complete, 10 ml of solution was centrifuged using a centrifuge at 3200 rpm. Then 1 and 0.5 ml of the clear solution (for 20 and 50 mg caffeine gum respectively) were removed and buffered up to 10 ml volume and absorbencies of these solutions were measured by the spectrophotometer set at wavelength 276.8 nm. Also, the placebo gum was dissolved in chloroform, and its absorbance was measured using the same method. This absorbance was subtracted from the gums absorbencies. The Latin-Square design was used for the evaluation of organoleptic characteristics of the formulations and 20 mg caffeine gums with formulations F 1 to F 13 were prepared, and given to ten subjects. The subjects were asked for their opinions about the taste, softness/hardness, no stickiness to teeth, and mass volume of the gums. Organoleptic characteristics of 50 mg gums were investigated by ten subjects as well. In the questionnaire forms, subjects according to the Likert scale as suggested words with scores 1-5 reported their opinions. The Latin-Square design was used for the preliminary evaluation of taste of the formulations too. 20 mg caffeine gums with best formulation based on softness/hardness, no stickiness to teeth and mass volume of gum were prepared in six flavors (peppermint, eucalyptus, cherry, banana, cola and cinnamon) and were distributed among ten subjects and were asked for their opinions about the flavoring agents. In this investigation, two flavoring agents earned the highest score. After this stage, some gums from the best formulations in terms of flavor were prepared and given to 20 subjects, and finally, one flavor was selected. In this opinion test, subjects reported their opinions about taste according to the Likert scale as excellent = 5, good = 4, fair = 3, poor = 2, very poor = 1. After preparation of various concentrations of caffeine in phosphate buffer and measurement of their absorbencies, the absorbance-concentration curve was plotted, and direct linear equation and Regression coefficient (R2 ) were obtained. Direct linear equation was y0 = 0.053x + 0.004 and R2 was 0.999. Furthermore, after preparation of various concentrations of caffeine in chloroform and measurement of their absorbencies, the absorbance-concentration curve was plotted. Here direct linear equation was y = 0.048x + 0.004 and R2 was 0.999. Caffeine gums, 20 and 50 mg, were prepared in 22 formulations and were coated using a sugar coating method [Table 1] and [Table 2]. The release of caffeine from the gum base is shown in [Figure 1]. Caffeine gums of 20 mg released about 47%, 75% and 88% of their drug and 50 mg gums released about 55%, 78% and 89% of their drug after 10, 20 and 30 min respectively. Weight variation of gums was within the united state pharmacopeia (USP) - recommended limit of ± 5%. The mean drug content was 19.75 ± 1.06 for 20 mg and 48.87 ± 2.76 for 50 mg caffeine chewing gums, all satisfying the criteria commonly required by USP for solid dosage forms. [Table 3] shows the content of 10 gums that were randomly selected from 20 and 50 mg caffeine gums. Ten subjects were given 20 mg caffeine gums with F 1 to F 13 formulations, and their organoleptic characteristics were evaluated. F 10 , F 11 and F 13 formulations earned the highest scores. Results of these investigations were shown as average scores in [Table 4]. At the next stage, gums were prepared with six flavors and were distributed among ten subjects in order to evaluate the taste of gums and choose the best flavors. The best flavors were cherry and cinnamon. Results of this evaluation were shown in [Table 5] as the sum scores out of 50. At the next stage, two selected flavors were given to 20 subjects, and one flavor (i.e., cinnamon) was selected for rest of the study. Results of this evaluation were shown in [Table 6] as the sum scores out of 100. 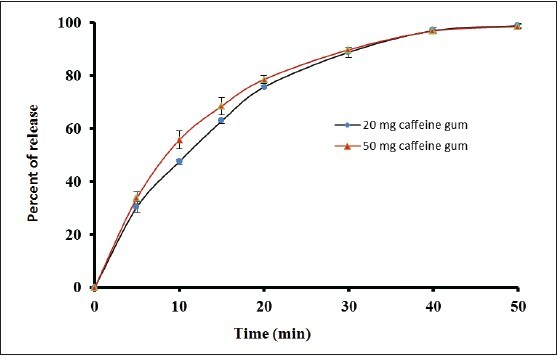 Ten subjects were given 50 mg caffeine gums with F 14 to F 22 formulations, and their organoleptic characteristics were investigated. F 21 and F 22 earned most points (F 22 formulation had more flavoring agent). Results of these investigations were demonstrated in [Table 7] as the average scores. 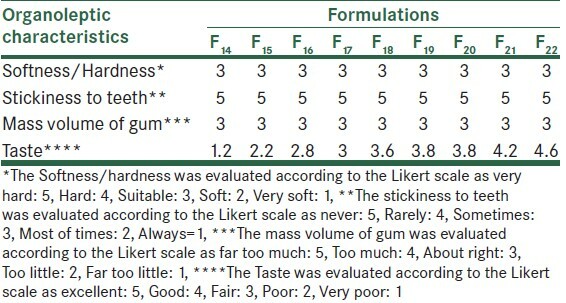 At the next stage, two gums with most scores (F 21 , F 22 ) were given to 20 subjects in order to be evaluated in terms of taste. Finally, one formulation (F 22 ) was selected. Results of this evaluation were shown in [Table 8] as the sum scores out of 100. The gum's flavor is a key part in its formulation. If it is undesirable, it influences on person's compliance. Thus, it is very important to use a flavoring agent compatible with other ingredients in the formulation. Selection of a flavoring agent is determined with drug's taste. Usually for covering the bitter taste of drugs, chocolate, peppermint and cherry are used. Also, aspartame as a sweetening agent can cover the bitter taste of drugs. In the other study, sweeteners such as sodium saccharine and liquorice had moderate or no effect on masking the bitter taste of nicotine gums respectively, but aspartame showed the strongest effect on modifying the bitter taste of it. Generally for this purpose using the sweetening agents and flavoring agents could help to significantly improve the gum's taste. When we evaluated the effects of the flavoring agents on the organoleptic characteristics of the gums, our results showed that generally the flavoring agents had a softening effect on the formulations. However, the peppermint flavor caused the gums to be dry and fragile. Among these flavoring agents, eucalyptus flavor had a strong softening effect such that when added to the F 8 formulation which had a softer base than F 3 formulation. It caused excessive softening of the gum, while other flavors only slightly improved the softness state of the gums [Table 4]. 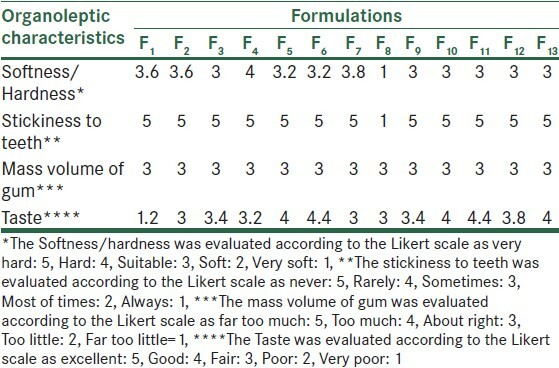 We preferred to use the F 9 formulation for peppermint flavor and F 3 formulation for eucalyptus flavor and for other flavors formulations similar to F 7 were selected, because in the opinion tests formulations with similar gum base as F 7 had better and more suitable organoleptic properties [Table 5]. Adding flavor to the gum base should be performed in the last stage and at a temperature below 40°C, because a temperature above 40°C causes the flavoring agent to deteriorate. Moreover, adding flavoring agents at a temperature below 40°C may cause softening of the gum. In this investigation, at the first stage, two flavoring agents (i.e., cherry and cinnamon) had higher scores [Table 6]. At the next stage, F 11 (gum with cinnamon taste) was selected as the best formulation based on the organoleptic characteristic and taste. This formulation was selected for the preparation of 50 mg caffeine gums in the rest of the study. 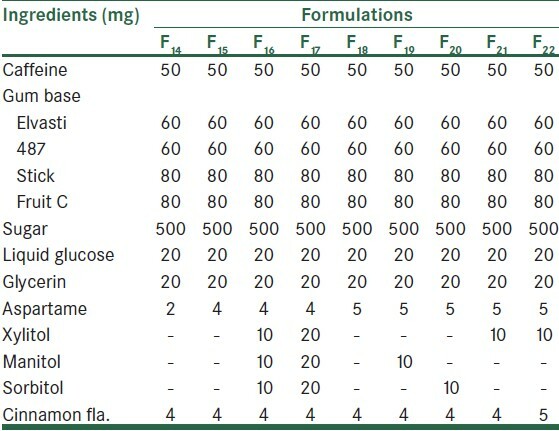 When producing the 50 mg gums, because the amount of caffeine in formulation was higher, we used more aspartame compared to the 20 mg caffeine gum, as well as manitol, sorbitol, xylitol and finally, more flavor until at the end a formulation with suitable taste was achieved [Table 7] and [Table 8]. Medicated gums are formulated such that they release the maximum amount of their active component in an appropriate time. There are various factors that influence the release and absorption of the drugs, for example, rate and intensity of chewing and the amount of saliva that is produced. The release rate of the drugs from medicated gums depends on their water solubility. Water soluble substances are released from medicated gums completely and rapidly. On the contrary substances that are less soluble in water are released from medicated gums incompletely and slowly. Water solubility of caffeine is 1 in 50. Moreover, it is known that when a drug has a water solubility between 1 in 10 and 1 in 300, 60% of the drug is released from the gum during 10 min. Accordingly, if these gums are chewed for 15 min, between 50% and 90% of the drug will be released. In this study caffeine was released from the gum base as we expected. After 20 min chewing approximately 75% and 78% of caffeine was released from 20 to 50 mg gums respectively. This increased to about 90% after 30 min chewing for both formulations [Figure 1]. Furthermore, another research performed by Henry T. Tyrpin and his colleagues showed that caffeine has a slow-release rate from the gum such that after 20 min about 88% and after 40 min about 97% of it is released. In this study, the authors stated that to control the release, they had to change the physical properties of caffeine by coating the caffeine particles. Indeed, coating the caffeine particles with methods such as encapsulation or agglomeration can change caffeine release; depending on the type of coating substances and the degree of coating, the release rate could become faster or slower. This could be very effective in decreasing the bitter taste of caffeine. In the present study we used gum bases with different characteristics and ratios and therefore, caffeine release of the gum was controlled. During the preparation of the caffeine gums, triturating caffeine powder with aspartame and xylitol and levigating this mixture in glycerin and liquid glucose resulted in coating of caffeine particles which in turn decreased the bitter taste of it and kept the sweet taste until the end of chewing. According to our findings, 20 and 50 mg caffeine gums with suitable organoleptic properties can be prepared. F 11 of 20 mg gums and F 22 of 50 mg gums were the best formulations in terms of organoleptic characteristics. Best flavoring agent and sweetener for these gums that could modify bitter taste of caffeine were cinnamon flavor and aspartame sweetener. These gums had desirable release and acceptable content uniformity. Consequently, our study confirmed that gums provide suitable dosage forms for drug delivery of caffeine. This study was supported by Isfahan University of Medical Sciences as a thesis research project numbered 390472. 1. Levine MD. Keeping a head in school: A student's book about learning abilities and learning disorders. Cambridge, MA: Educators Publishing Service. Inc; 1990. p. 29-53. 2. Halvani G, Baghianimoghadam M, Rezaei M. Fatigue situation in tile industries workers. Iran Occup Health 2007;4:57-63. 3. Dórea JG, da Costa TH. Is coffee a functional food? Br J Nutr 2005;93:773-82. 4. Quinlan PT, Lane J, Moore KL, Aspen J, Rycroft JA, O'Brien DC. The acute physiological and mood effects of tea and coffee: The role of caffeine level. Pharmacol Biochem Behav 2000;66:19-28. 5. Sweetman SC. Martindale: The Complete Drug References. 36 th ed. London: Pharmaceutical Press; 2009. p. 1116-8. 6. Nehlig A, Daval JL, Debry G. Caffeine and the central nervous system: Mechanisms of action, biochemical, metabolic and psychostimulant effects. Brain Res Brain Res Rev 1992;17:139-70. 7. Carper J. Food-Your miracle medicine. New York: Harper Collins Publisher; 1994. p. 359-93. 8. Kamimori GH, Karyekar CS, Otterstetter R, Cox DS, Balkin TJ, Belenky GL, et al. The rate of absorption and relative bioavailability of caffeine administered in chewing gum versus capsules to normal healthy volunteers. Int J Pharm 2002;234:159-67. 9. Energy fiend, caffeine in food. Available from: http://www.energyfiend.com/caffeine-in-candy. [Last updated 2012 11 30]. 10. Paton CD, Lowe T, Irvine A. Caffeinated chewing gum increases repeated sprint performance and augments increases in testosterone in competitive cyclists. Eur J Appl Physiol 2010;110:1243-50. 11. Smith A. Effects of caffeine in chewing gum on mood and attention. Hum Psychopharmacol 2009;24:239-47. 12. Madhav NV, Shakya AK, Shakya P, Singh K. Orotransmucosal drug delivery systems: A review. J Control Release 2009;140:2-11. 13. Patel VP, Desel TR, Dedakiya AS, Bandhiya HM. Medicated chewing gum: A review. IJUPLS 2011;1:111-28. 14. Curro FA. Gum chewing as an adjunct to use of medications. J Am Dent Assoc 2008;139:6-8S. 15. Rassing MR. Specialized oral mucosal drug delivery system: Chewing gum. In: Rathbon MJ, editor. Oral Mucosal Drug Delivery. Vol. 74. New York: Marcel Dekker. Inc; 1996. p. 319-57. 16. Clarke's Analysis of Drug and Poison. 3 th ed. London: Pharmaceutical Press; 2004. p. 736-7. 17. Aslani A, Rafiei S. Design, formulation and evaluation of nicotine chewing gum. Adv Biomed Res 2012;1:57. 18. European Pharmacopoeia. 6 th ed. Strabourg: Directorate for the Quality of Medicine and Health Care of the Council of Europe; 2009. p. 278. 19. Boylan JC. Liquids. In: Lachman L, Liberman HA, Kanig JL, editors. The Theory and Practice of Industrial Pharmacy. 3 rd ed. Philadelphia: Lea and Febiger; 1986. p. 457-87. 20. Rowe RC. By gum-A buccal delivery system-Private prescription: A thought-provoking tonic on the lighter side. Drug Discov Today 2003;8:617-8. 21. Tyrpin HT, Russell MP, Witkewitz DL, Johnson SS, Ream RL, Corriveau CL. Caffeine coated chewing gum product and process of making. US Patent 2002; [6,444,241].